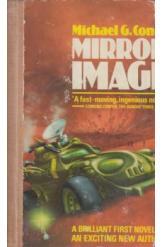 Mirror Image by Michael Coney, Sci Fi. Book is in good condition, all pages intact. Colonists on the planet Marilyn discover a shapeshifting alien life form that they name the amorphs. At first, the colonists use the amorphs for labor, but when a lab experiment allows them to perfectly mimic a human body and brain the creatures become capable of rebellion. The conflict comes to a head when an amorph figure attempts to give birth to an alien messiah.